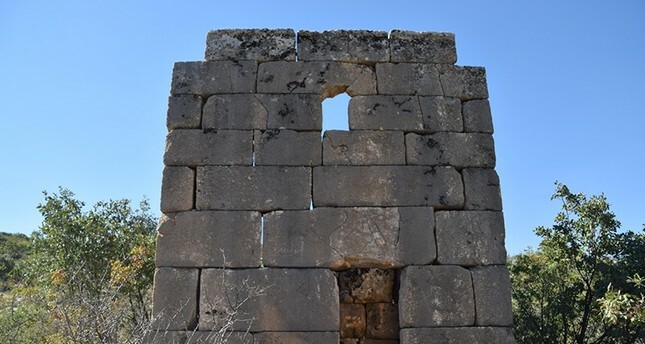 Museum officials in southeastern Turkey's Adıyaman province said Monday they have discovered the remains of a Roman-era military observation tower. Passers-by in the Gerger district saw the remains and informed the museum. A team from the Adıyaman Museum inspected the site, and determined the 2,000-year-old tower was 5 meters high with a diameter of 9 square meters. The east entrance door, made of stone weighing 400-800 kilograms (880-1765 pounds), has a sword symbol engraved at its top. Mehmet Alkan, deputy curator of Adıyaman Museum, said most of the structure remained intact. Alkan also said they would apply to a cultural assets protection board in neighboring Şanlıurfa province to register the tower.